A few months ago, in our lab we tried to enable SSH access to our ESXi hosts and these are the steps we followed. First, if you have access to the ESXi console, hit F2 and log in. From the System Customization screen, go to ‘Troubleshooting Options’, and hit <Enter>. In the ‘Troubleshooting Mode Options’ screen, you see a bunch of toggle options. Go to ‘Enable SSH’ and hit <Enter> (when you hit <Enter>, the option toggles to ‘Disable SSH’). Earlier in the lab, during set of a new ESXi host, we ran into this cryptic error. Step 2: Connect to ESXi host using putty. Step 3: Enter root and password to log in. Step 4: Enter the command esxcfg-scsidevs -l to list the name of the disk that you want to wipe. Step 6: Now lets delete this partition using “partedUtil delete” command. After running this command successfully, you could not go back to vSphere Client and recreate data store. Recently, during troubleshooting an issue with one of our customers, some patterns emerged that indicated the possibility of resource contention for their repeated timeout issues. Upon further digging in, the CPU usage was abnormal. The database server was on a Virtual Machine with 8 processors allocated. The CPU usage was only on one processor. The rest were idle. 0% usage. As part of that experience some lessons were gathered out of which today’s post emerges on CPU Affinity mask. Sql Server uses all CPUs available through the Operating System. It creates schedulers on all the CPUs to make the best utilization of the resources for any given workload. Operating Systems, as part of its multitasking, it needs to switch process threads from processor to another. This is usually not detrimental for normal operations; But resource intensive operations like Sql Server this undercuts performance. Such Context Switching is not always a welcome scenario. To minimize we could configure the processors in a way that all the Sql Server load will be directed to a pre-selected group of processors. This is achieved using CPU Affinity Mask. As you imagine, this is a HEX value. But we convert the HEX value into integer and configure Sql Server to lean towards (affinitize) a group of CPUs. The options on the top convey that we are enabling Sql Server to fully manage the resource allocation with all the CPUs. I/O tasks like Lazywriter, CHECKPOINT, Log Writer, etc are directly affected by the dedicated CPUs allocated for I/O activities. NUMA Noode0 and NUMA Node 1 are the CPU groups (either Hardware or Software configuration) to enhance hardware resource consumption. Each NUMA node has multiple CPUs with dedicated memory. 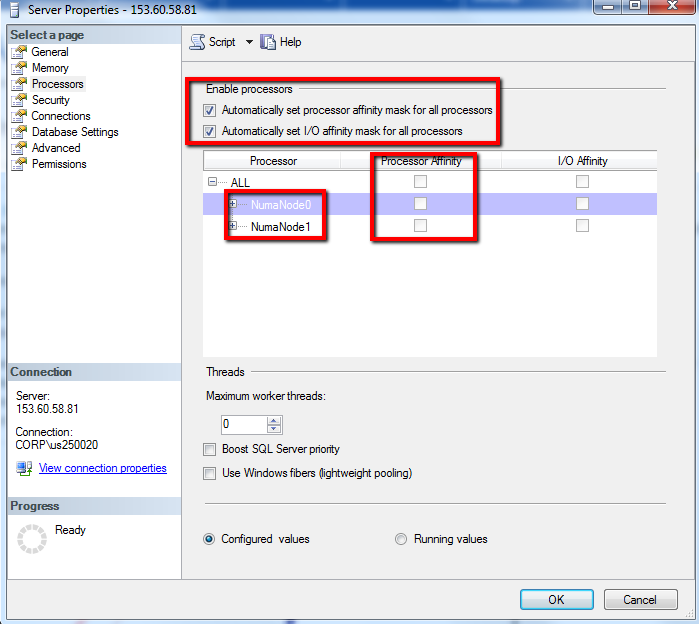 The ‘Processor Affinity’ Check box allows you to select individual CPUs, from each NUMA nodes, to SQL Server. Since the check box is not checked, none of the CPUs (from that NUMA node) have their affinity set (not allocated primarily for Sql Server). 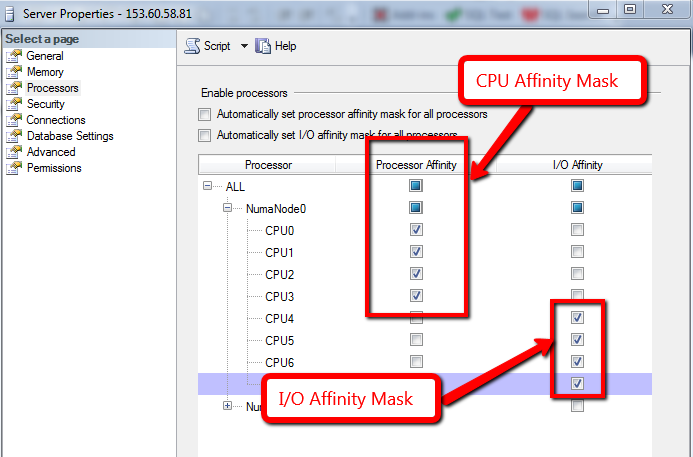 Affinity Mask for each processor could be set using a 1 or 0 bit flag. 1 signifies the affinity being set. So each processor has an affinity mask bit flag that controls its affinity. Imagine setting 1 (bit) for each allocated CPU; Then convert that value into INTEGER. In Binary the result looks like this 00001111; It translates to 0X0F in HEX. Which is 15 in integer. This is the value you want to set for ‘affinity mask’. Now, let’s try the same logic for I/O affinity mask. Let’s set the last 4 bits to 1. So, 11110000 in binary translates to 0xF0 in HEX and 240 in integer. One byte (8 bits) covers affinity mask for 8 CPUs. And two bytes for 16 CPUs, 3 bytes for 24; 4 for 32 CPUs. For more than 32 processors, you want to use affinity64 for another 32 processors. It is recommended not to use the same CPU for both CPU affinity and I/O affinity. Changing CPU affinity mask does not require restart. For more information read MSDN BoL article. More and more database servers are being migrated into virtual machines. The momentum towards virtual machines is strong, with good reasons, and as a DBA we need to come up with ways to make sure that our database servers are correctly configured to fully utilize the capabilities of virtual environments. Database servers are usually the last ones to be converted into virtual machines for obvious reasons, but in general, not all database servers need to be physical machines.= ir even have a dedicated machine, per se. A good percentage of the database servers we have are small (to medium) size that it would not make much different if we virtualized them. Though the migration effort has become simpler with better tools availalbe, the task of comeing up with appropriate database configurations to fully utilize the resources of virtual environment while maintainig the same performance (SLA) is a non-trivial task. More on this subject later, but today, the topic is on vCPUs. Hypervisor software take full control of the hardware on the host machine and allows system administrators to present them to the virtual machines as needed. This capability allows us to enhance hardware resource utilization and bypass some license agreement restrictions. For example, Windows 2003 Standard Edition is limited to 4 CPUs. So if you have a machine with 6 or 8 CPUs, then the Operating System will only see 4 CPUs. With VMWare there is a way to get around this, a.k.a. cpuid.coresPerSocket/sockets option. In VMware, vCPUs appears to the operating system as a single core single socket CPU (over simplified). vCPUs are scheduled on the logical CPUs which are hardware execution contexts. So, when you assign 4 vCPUs to a virtual machine, the Operating System on the VM sees them as 4 CPU sockets with single cores each. Now with cpuid.coresPerSocket/sockets option, we could configure the 8 CPUs from host machine as 4 CPUs with 2 cores each (4*2=8 vCPUs) or 2 CPU sockets with 4 cores each (2*4=8 vCPUs). This is an over simplified summary f the underlying details for easy consumption. For more detailed explanation, please refer to this article on VMWare. A physical machine with 4 sockets with 4 cores each is not same as a Virtual machine with 4 Sockets with 4 cores each (using above settings). A vCPU is close to a core, but not exactly a core. It is the logical execution context (thread) on a core. A core could have 1 or more logical CPUs (threads). This difference matters of a database server as they are very resource intensive machines. When the database server is processing 3000 or more transactions per second, having available CPUs to process the requests is important. A shared CPU (logical CPU a.k.a. CPU thread) could result in CPU bottleneck; Might result in heavy SOS_SCHEDULER_YIELD waits. There are some techniques to over come these situations, but need close coordination with System Administrators. As a rule of thumb, small and medium database server (in terms of traffic, size, payload etc) usually make better candidates for virtual machines than VLDBs.